Playing with My Food, Again. I love grilled cheese sandwiches but I wanted to do something a little more interesting than that. I was thinking along the lines of an Insalata Caprese [mozzarella Teese, basil and tomato with olive oil] but then flashed on the strawberries in the fridge and that then led to a longing for a thick and syrupy balsamic glaze. Then here is where it got seriously weird. I spied the peanut butter. Thing is? This sandwich was seriously delicious and I fully intend to make it again. So there ya have it…a decidedly weird and surprisingly delicious open-faced grilled Teese. Add balsamic vinegar to a small pan and bring to a simmer. Add in a tablespoon of sugar for each 1/4 cup you use. Reduce until thick and syrupy. Microwave a spoonful of peanut butter for 15 seconds to soften and drizzle over the melted Teese. 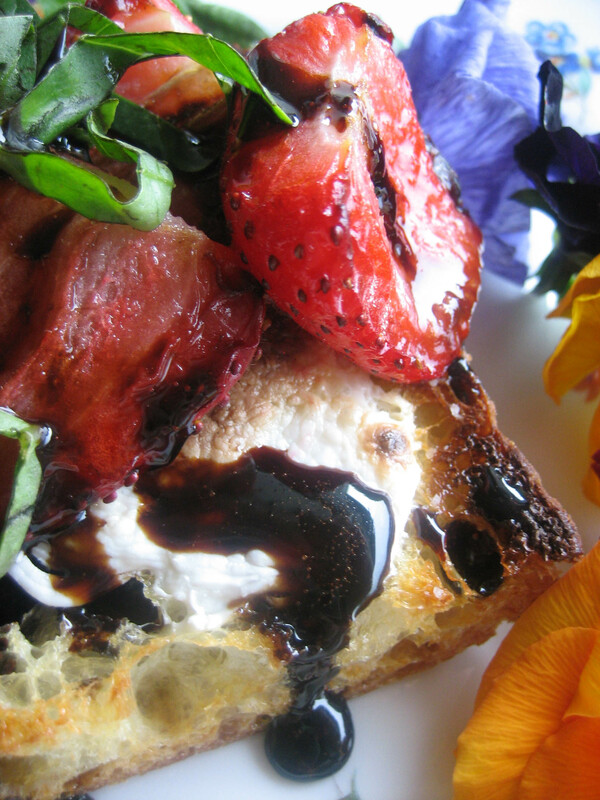 Top with strawberries and drizzle with the balsamic glaze. OK, WOW. I won’t even attempt to create anything quite THAT amazing… I’m so impressed. Seriously! “Trash?” Really? I don’t think so. You don’t understand, *laughing*, it was this weird combination that flew into my head and that I ate in about 15 seconds flat. Because of this I can no longer laugh at H for her old PBnJ sandwiches with Doritos in them. When I said “trash”, I meant trashy good! on February 19, 2010 at 9:31 PM | Reply The Teese Vegan Cheese Challenge! « Go Vegan Go! This looks like my kind of weird. I need to obtain some Teese. 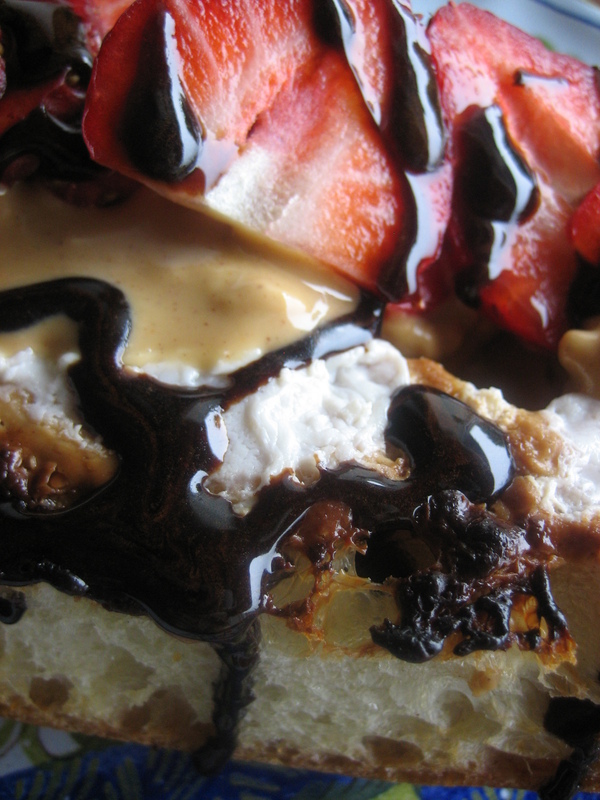 Looking at the photo, then skimming and seeing “peanut butter,” my immediate thought was that it was a grilled Teese with tomato, peanut butter, and chocolate syrup. That’s the joy about cooking. It’s a completely creative outlet. Take your ideas and run with them!